Millions of Classic Rock fans know Steve Morse as the long-serving guitarist for the legendary Deep Purple, while an equal number of people know drummer Rod Morgenstein as the timekeeper for ’80s Hard Rock hitmakers Winger. But for a legion of diehard fans, these two musicians will forever be known as members of one of the greatest cult bands of all time: The Dixie Dregs. 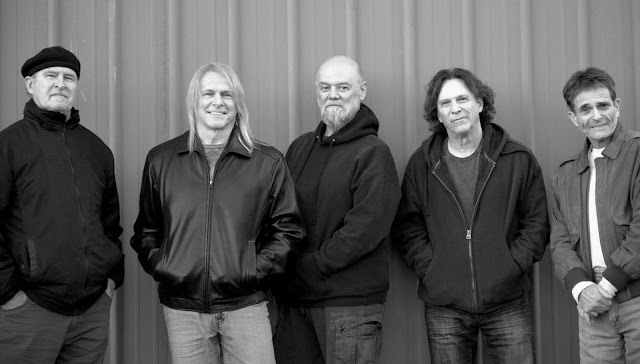 After 40 years, the band’s original lineup – Morse, Morgenstein, bassist Andy West, violinist Allen Sloan and keyboardist Steve Davidowski – recently regrouped to perform together for the first time since 1977’s still-extraordinary Free Fall. While there have been other Dixie Dregs reunions in the years following the group’s initial ’75- ’82 run, this particular jaunt finds the players who put the Dixie Dregs on the map ready to re-connect with their loyal fanbase and reignite the spark they first lit way back in the Carter era. Not surprisingly, nostalgia was in the air when the band recently hit Boston’s Wilbur Theatre. Simply seeing Sloan and Davidowski playing Dregs classics on stage together after so many years brought a grin to several faces in the crowd (which was largely comprised of folks who’ve clearly followed the band since their ’70s heyday), while West noted that a large percentage of the band’s current road crew have been with the band from the very beginning. While the first set in the band’s three-hour performance stuck closely to the Rock side of their repertoire (including a jaw-dropping performance of “Odyssey” off 1979’s What If), the latter half was a more esoteric affair. Sloan took center stage for the violin solo “Rachel,” while “Go For Baroque” (off 1981’s Unsung Heroes) demonstrated the vastness of the group’s sonic vocabulary. Other highlights of the evening included 1981’s “Day 444” (which finally made its live debut on this tour) and a blazing rendition of Free Fall’s immortal “Cruise Control.” Best of all, the smiles shared between band members throughout the night made it clear that they were having as much fun as their audience. Although The Dixie Dregs never truly achieved household-name status, the band’s time at the Wilbur Theatre showed what is possible when five musicians of the highest possible caliber join forces on the same stage. Trends come and go, but true musical chemistry is timeless.